UNITED NATIONS/WASHINGTON (Reuters) - Appearing relaxed enough to crack a joke, U.S. President Barack Obama took to the world stage on Tuesday after launching airstrikes in Syria against Islamic State militants but he is still facing huge political risks at home and abroad. The reason for Obama's good humor? His diplomacy paid off this time, with military contributions from five Arab states. One of his first items of business after arriving in New York for meetings at the United Nations was to personally thank representatives from the five. But heading into a U.S. congressional election campaign season where control of the Senate is at stake, Obama's new war could become problematic for him and his Democratic Party if all does not go smoothly. It could temper the enthusiasm of anti-war Democrats to turn out and vote on Election Day in November. Any problems with the mission could further dampen his approval ratings, now hovering around 40 percent, and embolden Republicans ready to pounce at the slightest misstep. Initially, at least, Obama was scoring points with both political parties for his actions. Opinion polls could be expected to show some Americans will be pleased Obama acted to retaliate against Islamic State after the extremists beheaded two American captives and taunted the United States. Frank Newport, editor in chief of the Gallup polling organization, said polling on Sept. 20 and Sept. 21 found majority support for military action but "whether that will be translated into increased support for the president at least as we measure it is still unknown." A Reuters/Ipsos poll published on Sept. 12 showed that Americans support Obama's campaign of airstrikes but they have a low appetite for a long campaign. Sixty-four percent of people in the online survey said they backed the campaign. Twenty-one percent were opposed and 16 percent said they did not know. Obama could face problems with Congress. The vote to authorize the use of force that lawmakers approved last week did not give Obama carte blanche to carry out this fight but rather it was a limited vote for a narrow, two-month authorization to equip and train Syrian rebels. Lawmakers will be taking up this issue again after the election. "His presidency was built on getting out of wars, not getting in them," said James Goldgeier, dean of American University’s School of International Service in Washington. "It's certainly risky, but there is popular support there for doing something. So I think a lot is going to depend on how it goes." 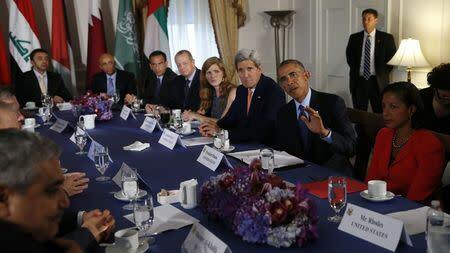 Obama, who shied away from airstrikes in Syria a year ago, had a slow reversal in course. A year ago he saw no positive outcome for getting involved in Syria’s civil war. Spurred into action by the rapid rise of Islamic State, Obama has become what he worked really hard to avoid becoming, a war president. But he has sought to make sure the United States was not acting alone. His mood was such afterward that he told a joke about the pregnant Chelsea Clinton after former President Bill Clinton introduced him at the Clinton Global Initiative. "If Chelsea begins delivering while I’m speaking, she has my motorcade," Obama said to laughter. Now, his challenge is to negotiate a careful path in the Middle East, keeping Syrian President Bashar al-Assad from interfering in going after more Islamic State targets. Aides said they doubt Assad will respond, since it has no control over the area that the airstrikes targeted. Obama must make sure Iraqi Prime Minister Haider al-Abadi follows through on forming a government that includes Sunnis, and perhaps most importantly, must get a rebel Syrian army prepared to hold ground cleared by the airstrikes.